The divine technology of Homas (Fire Labs) is known to bring grace and power into your life. Are you missing this divine technology due to financial constraints? That will not be a barrier any longer. We care about your wellbeing and do not want you to miss out, so once a month there is a special Homa (Fire Lab). To honor the symbolic divine exchange, you can participate in the Homa each month by donating the amount you can contribute. As Dr. Pillai says, “You can reverse the karma that has not yet attacked you, that has not yet started to hurt you, and for that you need tools.” AstroVed is making it super easy for you to participate. Our best wishes for you to enjoy and prosper in your life. 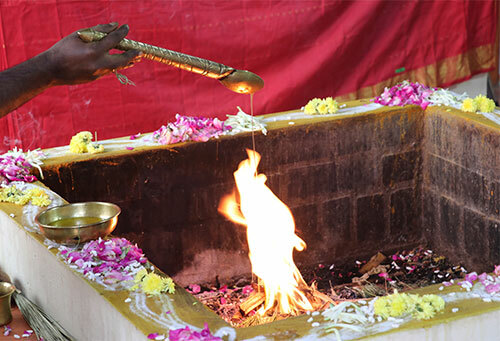 You are invited to take part and receive the graceful blessings of a particular archetype on their power day as our Vedic Priests perform the prescribed Homa (Fire Lab), every month, to invoke the energy and blessings of the archetype. This is your opportunity to accrue the benefits on their respective power days. This monthly homa is performed based on donation. Why should there be any charge? It is a way for you to make the first step and set up the correct energetic exchange between you and the divine. 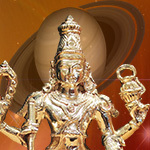 This Homa invokes the blessings of the Navagraha (9 Planets) – Sun, Moon, Mars, Mercury, Jupiter, Venus, Saturn, Rahu, and Ketu, who according to Vedic Astrology play a very important role in your life. The position of these nine planets at the time of your birth constitutes your birth chart and has a great influence on your actions and reactions to every life situation. Appease the powerful planetary deities with this special fire ritual to invoke their blessings, remove all obstacles in your life due to planetary afflictions and lead a happy, healthy and prosperous life. AstroVed will be performing Navagraha Shanti Homa on May 12, 2019 (IST) invoking the combined blessings of the 9 planetary deities. Participating in the homa can reduce the intensity of planetary afflictions in your birth chart and grant overall prosperity and happiness. Our qualified Vedic specialists with years of experience perform the rituals by chanting sacred mantras, maintaining the sanctity and purity of the occasion with a deep reverence for the Navagraha. This Homa invokes the blessings of the Navagraha (9 Planets) – Sun, Moon, Mars, Mercury, Jupiter, Venus, Saturn, Rahu, and Ketu, who according to Vedic Astrology play a very important role in your life. Appease the powerful planetary deities with this special fire ritual to invoke their blessings, remove all obstacles in your life due to planetary afflictions and lead a happy, healthy and prosperous life.